Continuing the interoperability in Weka that was started with R integration a few years ago, we now have integration with Python. Whilst Weka has had the ability to do Python scripting via Jython for quite some time, the latest effort adds CPython integration in the form of a "wekaPython" package that can be installed via Weka's package manager. This opens the door to all the highly optimised scientific libraries in Python - such as numpy, scipy, pandas and scikit-learn - that have components written in C or Fortran. Scikit-learn is a relatively new machine learning library that is increasing in popularity very rapidly (see the latest KDNuggets software poll). Like the R integration in Weka, the CPython support allows for general scripting via a Knowledge Flow Python scripting step. This allows arbitrary scripts to be executed and one or more variables to be extracted from the Python runtime. 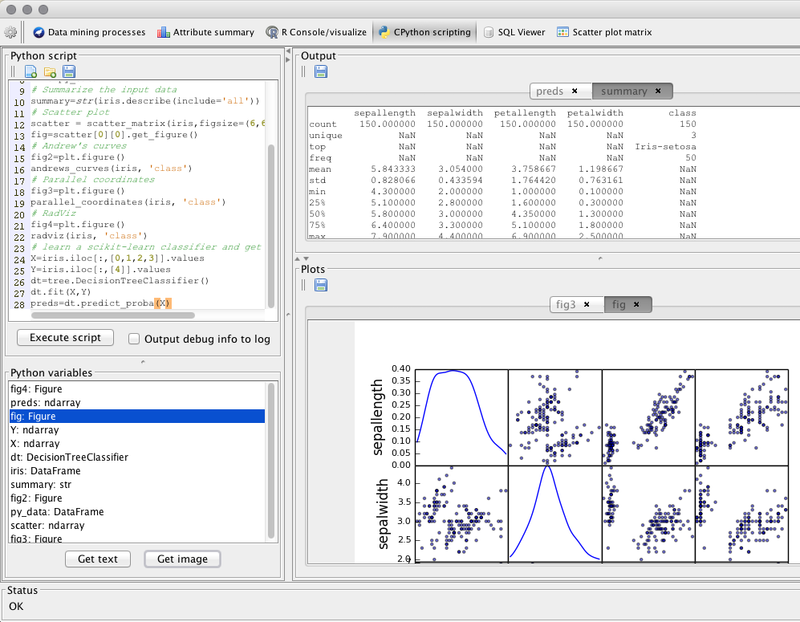 Weka instances are transferred into Python as pandas data frames, and pandas data frames can be extracted from Python and converted back into instances. 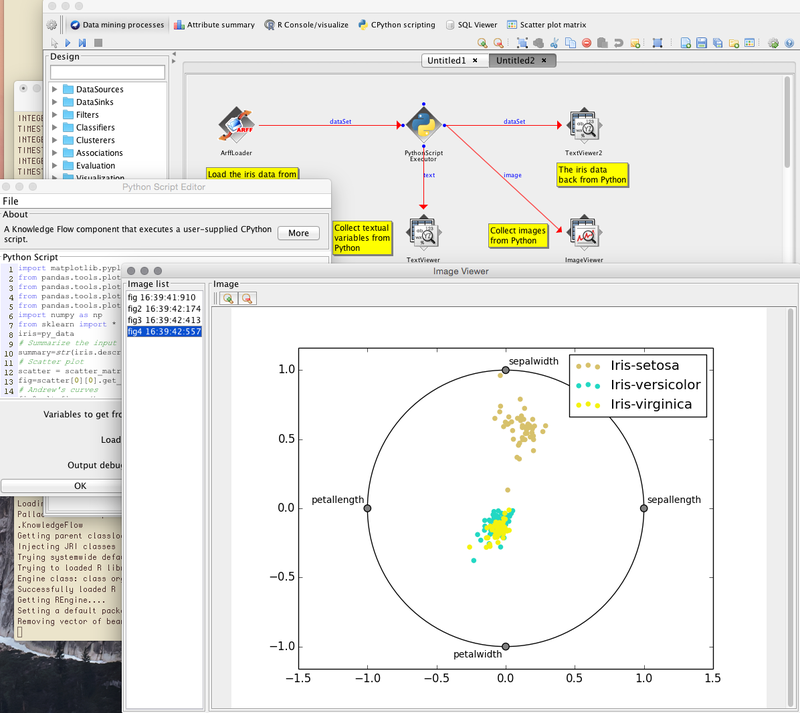 Furthermore, arbitrary variables can be extracted in textual form, and matlibplot graphics can be extracted as PNG images. This classifier wraps the majority of the supervised learning algorithms in scikit-learn. The wrapper supports retrieving the underlying model from python (as a pickled string) so that the ScikitLearnClassifier can be serialised and used for prediction at a later date. This clusterer wraps clustering algorithms in scikit-learn. 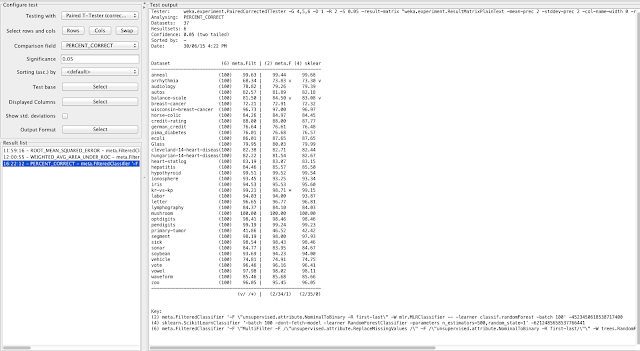 It basically functions in exactly the same way as the ScikitLearnClassifier, which allows it to be used in any Weka UI or from Weka's command line interface. The underlying integration works via a micro-server written in python that is launched by Weka automatically. Communication is done over plain sockets and messages are stored in JSON structures. Datasets are transmitted as plain CSV and image data as base64 encoded PNG. wekaPython works with both Python 2.7.x and 3.x. As it relies on a few new features in core Weka, a snapshot build of the development version (3.7) of Weka is required until Weka 3.7.13 is released. 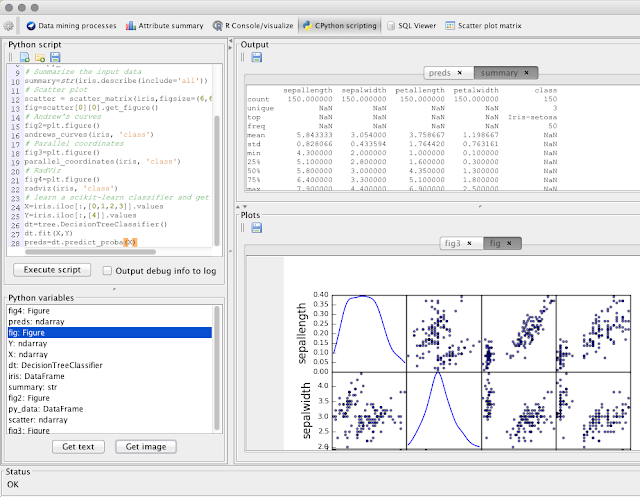 Numpy, pandas, matplotlib and scikit-learn must be installed in python for the wekaPython package to operate. Anaconda is a nice python distribution that comes with all the requirements (and lots more). Assuming that the python executable is in your PATH, and that is available to Weka when you launch Weka, then there may be an issue with write permissions for python. Where did you install Anaconda, and as which user? The easiest way to get things working is to install Anaconda into your own account as you. OK, I reinstalled Anaconda 3 in my own account as you suggested and it now works. Thank you! Nice site, thanks for sharing. Check Girls WhatsApp Groups, Stylish Facebook Names for Boys.